Nevron's GDI+ graphics engine provides the 2D scene with state-of-the-art image quality and legibility, and also conforms to Windows standards for 2D graphics rendering. Image effects such as shadow, glow, bevel/emboss and lighting make it possible to apply complex visual styles to any 2D scene. Cluster Float Bar charts allow visual comparison between corresponding values of synchronized data ranges. 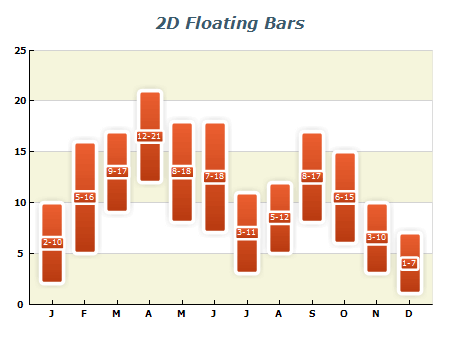 This example demonstrates a Floating Bar chart with custom DateTime values along the X axis. A Floating Bar chart can be used as a Gantt chart if the Y axis is in date-time scale mode. Gantt charts are popular in project management for planning the use of resources over time. Different activities that take place in the project are denoted by their start and finish dates/times. A Floating Bar Chart displays a sequence of horizontal or vertical bars, each bar representing a one-dimensional value range. Stack Float Bar chart is created by stacking one or more Bar series over a FloatBar series. This example demonstrates Stack Floating Bars with custom DateTime positions over the X axis. Stack Float Bar chart is created by stacking one or more Bar series over a FloatBar series.